The smartphone arena is filling up with more and more new contenders which are competing against the manufacturing giants. Various entry level phones are coming into the market sporting great hardware specifications. Consumers trying to get hold of a decent smartphone usually get confused about which brand to go for. Given a specific price range, consumers have a number of smartphones or tablets to choose from, and each of them has their own way of using the device. How do we assess the actual performance of a smartphone and compare it with that of other competing smartphones? 4 What the numbers mean? Benchmarking is one of the ways in which the performance of smartphones can be evaluated quantitatively. Benchmarks are some standard tests conducted on any device to assess its performance. Scores are allotted to each of these tests which help us to determine how well the device performed. Several benchmarking tools are available for Android, iOS and other mobile operating systems to test individual devices. Before buying a smartphone, one of the key things you want to determine is the budget and/or the specifications that you want to go for. Next, find all phones/tablets that fall within your criteria. Third, get a good benchmarking app. Geekbench is a great app available for Android and iOS, but it’s paid software. Free benchmarking tools include AnTuTu Benchmark and Vellamu. Run a benchmark on each of the devices and get the scores. The apps usually will let you compare your score with that of other phones. Fourth, determine how you intend to use your smartphone. For instance, if gaming is not your priority, you can consider losing a few points in 3D rendering and similar stuff. On the other hand, if web browsing is what you need, make sure your HTML 5 benchmark levels are high enough. For gamers, the GLBenchmark tool is a dedicated 3D rendering benchmark tool. Apart from hardware specific performance benchmarks, you can also test your network bandwidth utilization. This test is especially helpful for people who want to use their smartphones for browsing or downloading stuff from the internet. 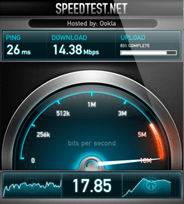 Speedtest is a cross platform application for assessing your devices’ network utilization. It gives you the maximum upload and download speeds attained by a device. To compare scores, run Speedtest on different devices simultaneously within the same network. The one with a higher score can probably utilize your network better. When a smartphone is advertised, usually the specifications are boasted. But two devices having similar specifications do not (necessarily) operate in similar ways! A phone having lower memory and speed than another phone might be able to give a better output on performance. Just an example here, Samsung Galaxy SIII has a higher RAM than iPhone 5, but iPhone 5 offers smoother and a more snappy experience than the SIII. Benchmark scores help us to distinguish devices based on their actual performance. Scores are set separately for each component: CPU speed, Calculations per second, GPU rendering, Disk read/write speed, etc. Different apps have different ways of assessing the benchmark scores, but the tests are more or less of similar type. However, for comparison’s sake, it is recommended to use the same benchmarking tool/app on all comparable devices. – Use the same tool to compare performance of devices. – Clear memory cache and close all running apps. – Decide which benchmarking tool will best define your purposes. Running a benchmark test on your favorite phone can be a problem in the retail environment. You might not get the permission to install and run an app before buying the phone. In that case, you can ask your retailer to perform a benchmark test in front of you. But that too might be difficult. However, the best thing to do would be to do your homework well. Conduct a small research on the various available phones within your criteria on the internet. Find out and analyze some benchmark scores on the internet. Compare and decide on which phone you want to go for. Also don’t forget to prioritize the features you want to have on your phone while comparing benchmark scores. Obviously, scores will vary from phone to phone. In the end it is up to you to choose the best of the lot.